Some conservatives like to complain about growth in city spending. In reality, spending by Minnesota cities has fallen significantly since the beginning of the century, after properly adjusting for inflation and population growth. The vast majority of this reduction has been in cuts to capital spending, which includes funding for city infrastructure. In 2000, city expenditures were $1,499 per capita. Per capita expenditures jumped 1.8% the next year, before beginning a long decline. This decline was driven in large part by a pair of recessions (in 2001 and the Great Recession from 2007 to 2009), which led to a sharp decline in city revenues—most notably in state aid to cities. Real (i.e., inflation-adjusted) city expenditures declined every year from 2001 to 2013, with only two exceptions. By 2013, city expenditures had fallen to $1,117—25% less than in 2000. Since 2013, total city expenditures have partially recovered, but remain well below the 2000 level. 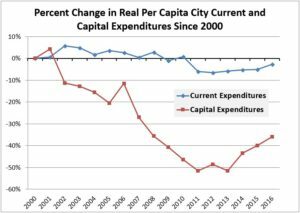 From 2014 to 2016, real per capita city expenditures increased at an annual average rate of 3.1 percent, fueled in large part by a partial restoration of past state aid reductions. However, by 2016, total city expenditures were $1,226 per capita—still 18% below the 2000 level. City spending falls primarily within two broad categories: current expenditures and capital expenditures. Current expenditures include wages, salaries, administrative expenses, and other short-term costs. In contrast, capital expenditures include spending to acquire long-term assets or to extend the life of existing assets, such as local streets, sidewalks, parks, and sewers. During a period of declining resources, city officials must decide what areas of the budget to cut and which to maintain. Cuts in funding for city services—such as policy and fire protection, parks, and libraries—generally have an immediate impact on a city’s quality of life. In contrast, reductions in capital outlays—such as pavement repairs and storm sewer maintenance—typically have a less immediate impact. Consequently, there seems to be an understandable tendency to prefer cuts to capital expenditures over cuts to current expenditures, at least in the short-term. This bears out based on an examination of city data during the 21st century. In 2000, city current expenditures were $859 per capita, while capital spending was $545 per capita. After a hike from 2000 to 2001, per capita capital spending declined dramatically over the next ten years. By 2011, capital spending had dropped to $264 per capita—less than half of the 2000 level. Capital spending remained at this level for approximately the next two years. Current expenditures per capita changed relatively little over the same period, hovering at or modestly above the 2000 level until 2010 and hovering just below the 2000 level from 2011 to 2013. By 2013, city current expenditures per capita were $808—6% below the 2000 level. From 2000 to 2013, per capita capital expenditures declined by $5.53 for every $1 decline in current expenditures. While capital expenditures increased more rapidly than current expenditures from 2013 to 2016, over the longer term the decline in capital expenditures is far greater. As of 2016, capital spending per capita remained $196 (36%) below the 2000 level, whereas current spending was $25 (3%) below the 2000 level. Reducing capital investments may have been necessary given reduced resources, but it carries long-term consequences—including increased infrastructure costs. Deferring capital investments generally leads to deteriorating levels of infrastructure quality over time; as infrastructure deteriorates, it becomes more expensive to repair and/or rehabilitate. In other words, the decision to forego preventative maintenance typically requires more expensive maintenance down the road, if not a complete rebuild of dilapidated infrastructure. Thus, reductions to capital spending can lead to greater financial pressures on a city in the long run. The decision to cut total expenditures in general and capital spending in particular was largely forced on city officials by conservative state policymakers, who railed against city property tax increases on the one hand, while cutting state aid to cities on the other. More on this in the second part of this series. *In the absence of this adjustment, these debt service expenditures would be effectively counted twice: once when the debt-funded expenditure is made and again when the debt is repaid. To avoid this double-counting, these debt service expenditures are excluded. However, the interest cost associated with borrowing is included in city expenditures. 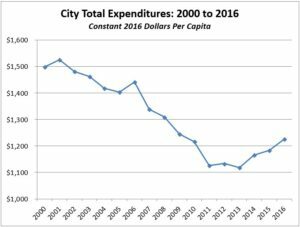 †In addition to current expenditures and capital outlays, city total expenditures as defined here include “interest and fiscal charges.” City interest and fiscal charges have declined by $5 per capita from 2013 to 2016. In 2016, interest and fiscal charges comprised 3% of total city expenditures.